It’s appearing over various places now that Anna was coming in Q3. Q3 puts Anna from July to September. Now that’s a little disappointing for those who have been waiting for it since last year. We thought “early 2011″, at least January, then February. We thought it was coming in April. It did kind of. It was officially announced it April though and we thought possibly late May, early-mid June. Having said that, we already heard back in March that the FIRST Major update wouldn’t arrive till the Summer. At least for that, Q3 is technically on track. X7 and E6 also announced back in April is expected in June. These slides came by way of a blogger mini event showcasing Anna as well as the X7 and E6. Nokia and software are the new Duke Nukem Forever. Nokia has pissed of its loyal fans / customers. 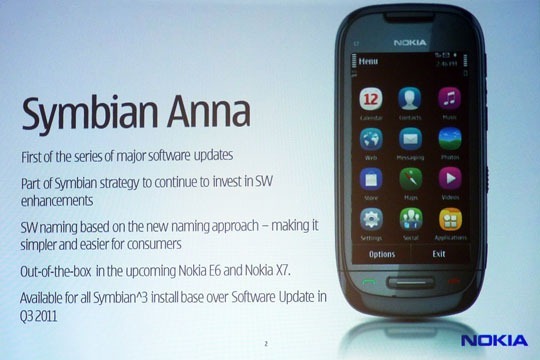 This entry was posted in N8 - Firmware, News, News Update, Symbian^3 on by Admin.